Whilst being one of the most popular bulbs generally, the more commonly known daffodils can sometimes be far from a gardener’s favourite plant. Requiring little skill or craft, they are grown commonly en masse in municipal and amenity planting of parks and public spaces. Presenting a bunch of daffodils as a gift can feel unimaginative, the trumpeting brass of a floral arrangement are not only bold in size and shape, but are also usually a monochrome yellow. The colour of road signs, bodily fluids and sick plants, yellow sits right at the front of our field of vision and therefore many designers may use it carefully or sparingly. 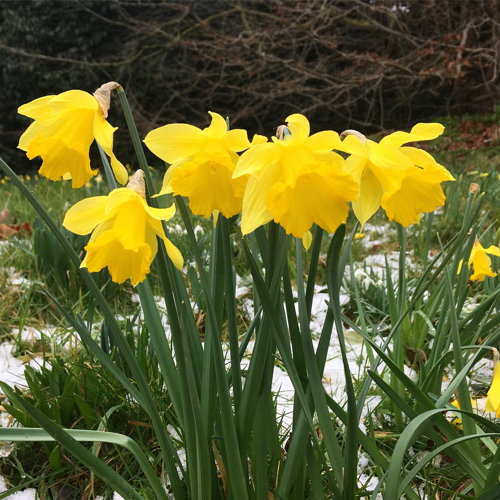 Yet in the 19th century when daffodils were first becoming a craze in Britain, through the likes of bulb traders such as Peter Barr, yellow was a newly accessible colour. Artists had long used rich reds and blues but struggled to find a bright yellow pigment. The discovery of chromium, originally from crystals found in a Siberian gold mine in 1762, was ground breaking in the visual arts. This new luxury in art may have resulted in its appeal as a symbol of decadence, and Oscar Wilde is celebrated by Peter Barr for encouraging the public to enjoy it. Perhaps for some of us today, we are too spoilt and saturated with bold yellow tones to be as easily able to properly appreciate them. There are only about 40 species of Narcissus (daffodils) in the world, yet they contain so much genetic information that thousands of named varieties have been produced. 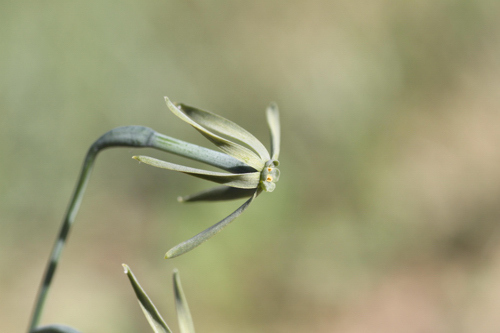 Popular hot spots for Narcissus are in the south-west of Europe, in places such as Portugal, Spain and France, where it is assumed they originate. In Britain, it is thought that they were brought over by the Romans, or were indeed genuinely native, but perhaps disappeared after the ice age and were then later reintroduced. 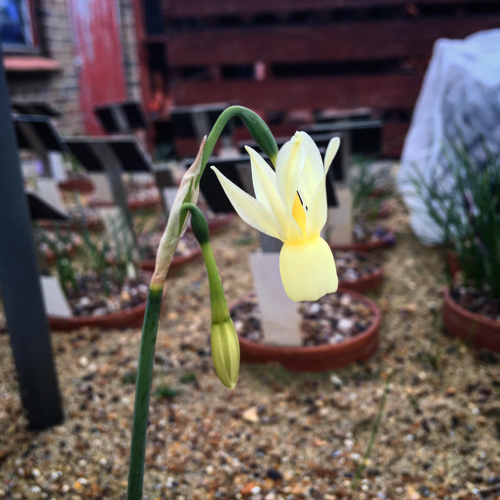 Narcissus are celebrated as providing material for some of the very first understanding behind hybridising. Regarded as a ‘pre-Darwinian Darwin’, William Herbert, born 1778, worked with Narcissus and published on the subjects of plant heredity descent and hybridisation. His work was enjoyed by Darwin who hails the pioneering work of Herbert within the pages of his ‘On the Origin of Species by Means of Natural Selection’. Most Narcissus are available to purchase as bulbs from late summer to autumn. The best time to plant is in autumn before frosts appear. Planting depths should be two to three time the size of the bulbs. A high phosphate feed can be given after flowering to encourage healthy growth. Most Narcissus bulbs produce bulbets each year, and in this way bulk up themselves in large clumps relatively quickly. 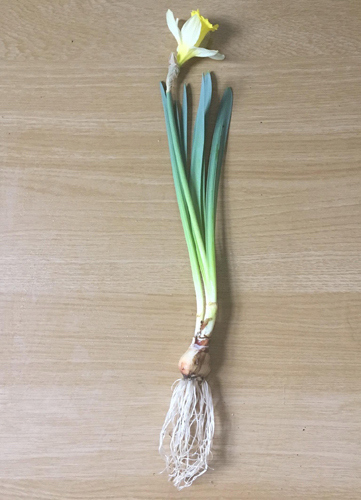 By using a fine brush or a cotton bud, hybrids can be produced via seed, just take the pollen from one flower and put it on the stigma of another during flowering. A fine mesh bag over the head of the flower can help prevent unwanted pollination. Seed heads can then be collected once they begin to crack, at which stage they should be placed inside paper bags and kept inside for a few days as seeds fall out. Sow fresh seed on top of a lightly compacted seed compost such as a sand, grit, coir and loam mix. Cover the seeds with a fine layer of compost, and a topping of fine grit to help prevent moss growth. Soak pots in a water tray and place out in a cold frame. Do not let them dry out and seed should germinate within the year, seedlings appearing like fine grass. For at least two years, keep plants in the same pot, after which time they can be planted out in the garden while dormant. Within 3-5 years the plants will produce flowers as well as leaves. 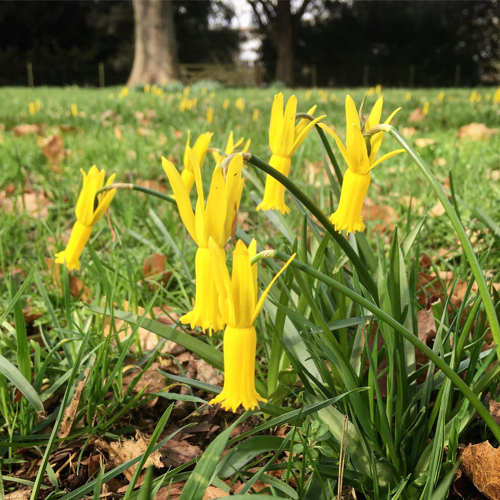 Narcissus cyclamineus is only 10-15cm tall and produces just one flower per stem. 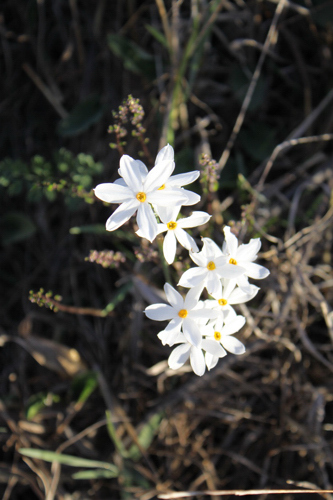 The flowers are always pendant, with a long narrow corona and petals reflexed back strongly. 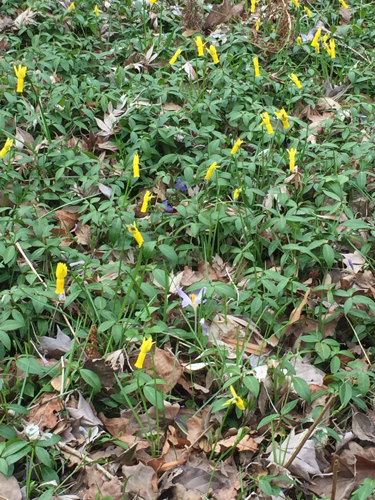 This species tends not to produce many offsets, so can be slow to establish a large clump, and as bulbs do not like being out of soil for even a matter of days, it can be hard to find and purchase. It does however set seed freely and if planted in conditions that it favours, seed will germinate and the species will naturalise. Two good examples of this species naturalised in woodland and grass can be seen at RHS Wisley and Great Dixter. 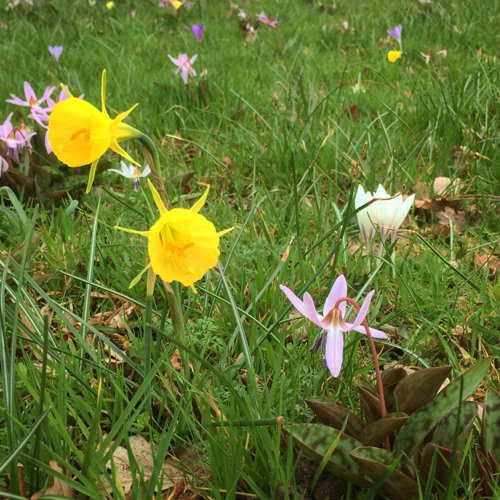 Whether you find the common types bright and cheery, or are of the opinion that daffs are naff, looking beyond the more commonly found varieties reveals a delicate array of miniature flowers that can be naturalised in lawns or grown in pots at front doors. 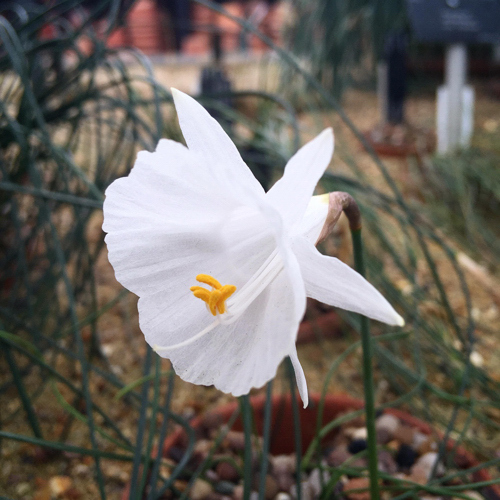 With such a diverse range, perhaps there really is a Narcissus to suit each and every garden and gardener. 2 Comments To "Plant of the Month March 2018"
I think this is a fair and valid point. Personal preference comes from each of our own experiences and interests. There is so much that could be said about daffodils, obviously a piece like this is limited in that it is only a short and light-hearted blog. Over-familiarity can make snobs of us all, and it is with humour that we comment on the more classic daffodils. When does a plant have more/less value is a good question, I suppose in our gardens it is as valuable as the joy it brings to the gardener and the wildlife. Thank you for your comment.